Sorry, no review of Pocket Puyo Puyo Sun yet. This game is cool. And it's actually quite fully-featured. If you have a Super Game Boy, you can play two-player with one cartridge. This may be the only way to play a game of SUN rules using a SNES, since Puyo SUN didn't get a SNES version. 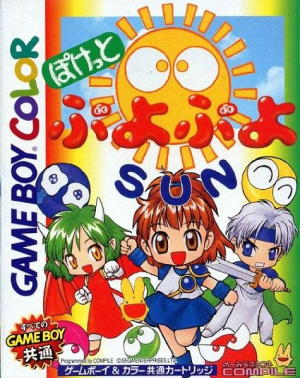 I think this is the only version of Puyo Puyo SUN that allows you to actually turn off the Sun and just play regular Puyo Puyo Tsu rules if you want. Of course you can play over link cable as well with another Pocket SUN cartridge - but this game actually supports playing over link cable with a Pocket Puyo Puyo Tsu cartridge as well. That's some remarkable backwards-compatibility I've only seen before in Pokémon Gen 2. This game has unlockable gallery images themed after tarot cards, which are fun. And this game can also connect with Puyo Puyo Sun 64 for the N64 using the Transfer Pak. I think it just unlocks more gallery images, but not 100% sure. If you're a Puyo fan, this version is pretty good! Of course modern Puyo games (such as Puyo Puyo eSports on Switch) are generally better options. But sometimes it's cool to play it on a Game Boy!